This weekend sees Stephanie heading off to the Port Fairy Folk Festival. Liz, who would sooner eat her own eyeballs than listen to folk music, is going to stay home and spend some quality time with her cat. Now, regardless about your feelings towards the music, it can’t be denied that folk festivals attract a certain … demographic. 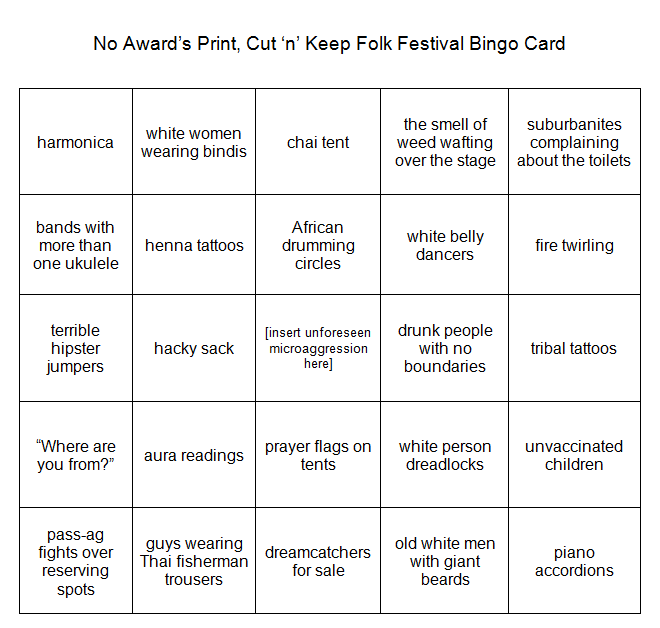 No Award apologises that this bingo card is presented as an image, and promises to learn to code tables. I’m particularly excited about the opportunity to see Christine Anu, so ner. OH MAN, I DIDN’T KNOW SHE WAS PLAYING! But I still can’t think of anything worse than a folk music festival. I feel like I kinda have an excuse for my remaining hippie-ish tendencies because I grew up in the country where there were actual hippies… But folk festivals still aren’t really my thing either. The food and stuff is pretty good, but there is also expensiveness and people crowds and music I probably don’t know.